I offer a service to you where I can rebalance and deep cleanse your chakras in person, or distantly wherever you are in the world. Click here to find out more and to book your treatment with Rachel or read on for some free advice on how to work with them yourself. What are the Chakras and why do they matter? Ancient Sanskrit texts define a chakra as being one of 7 points on the body where 216 energy channels (nadi) converge, forming a spiral of energy. The chakras are spinning vortices of spiritual energy essential to the emotional, physical and mental functions of the physical and etheric human body (mind, body and soul). When they function in a harmonious column as one, we are in balance. There are thousands of smaller chakra on the body, but the 7 main chakras are the ones we need to most focus upon. Each chakra is represented by a colour. Each chakra has a corresponding vibrational colour. 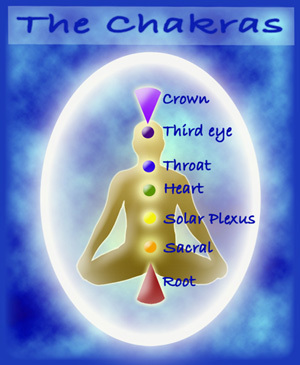 To visualise your chakras, try to picture them as spinning balls or wheels of energy, or gently opening lotus flowers. Visualise each chakra with light of that colour pulsating and glowing with the breath. This is a great start for the day, boosting energies and motivating the spirit! What will working on the chakras regularly help me to achieve? Stability, trust, grounding, good physical health, financial security. Pleasure, depth of feeling, vibrant sexuality, passion. Strength, purpose, will-power, vitality, spontaneity, increased self-esteem. Compassion, empathy, balance, self-worth, happy relationships, self acceptance. Clear communication, creativity, self -expression. Clairvoyant and mediumistic ability increased, good imagination, clarity of thought, accurate divination and interpretation. Awareness of the cosmos, consciousness, wisdom, knowledge, connection to Universal energy, one-ness. The colour of a stone is the key to it’s healing qualities in chakra work, corresponding with the colour of each chakra. Listed below are some of the stones that may be used on each Chakra. You can either hold crystals/stones in your hands while doing this or place the appropriate stone on the appropriate chakra. If you are attuned to Ethereal Crystal Therapy energies you can place a crystal over the appropriate chakra which will fall away from the aura when its job is done. Your crystals will need cleansing afterwards. * Lie down and place the appropriate crystal directly on top of the relevant chakra. * Hold the crystal in your hand over or beside the chakra you are working on. * Wear your crystal in a piece of jewellery that sits close to the chakra. I have a selection of different length chains to put my crystal pendants on. * Place your crystal in a small pouch and pin this to your clothing in the desired location. Now you’ve programmed your crystal for chakra work, place the crystal close to your chakra whenever needed. This will help balance the energy vibrations in your chakras from now on. I can rebalance and deep cleanse your chakras wherever you are in the world.